Another day on the ice! Perfect! For a few hours we planned on fishing with some guys we had met at the first tournament. With the slow bite we tried a new technique that opposed our normal style of run and gun fishing. Our buddy Andy grabbed the underwater camera and I had my T 7 Custom Rods. Checking around the holes we realized the fish were everywhere! They were tucked in the weeds, suspending in the channel, and cruising everywhere else. One by one we started targeting specific fish. The method was pretty effective! 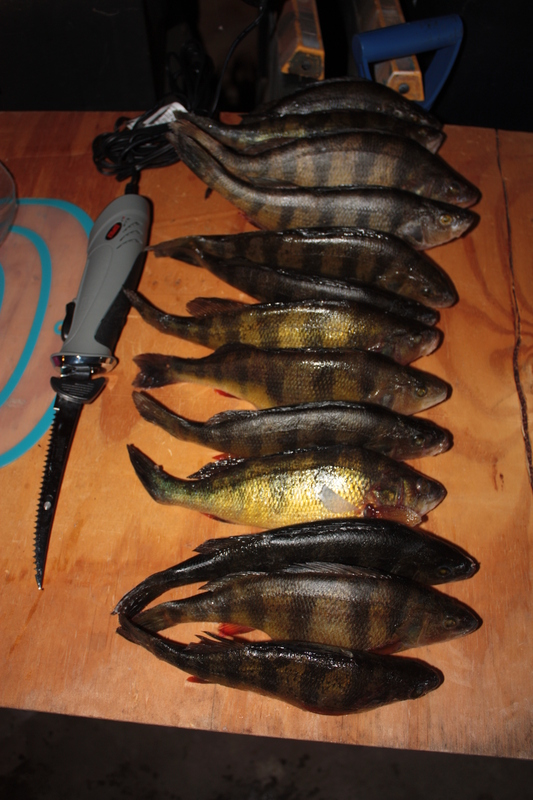 We caught some perch, crappie, and gills. After several hours on the ice, the slow bite had us bummed. We decided to call it quite and head to a new body of water. The moved to be ineffective. We caught fish and plenty of them. Unfortunately, the fish we caught tended to be between 3-5″. At least we had another ice report for the books! The day was ended well before sunset because of the hardships experienced throughout the day. With stop one of the Vermont Sportsman Hardwater Tournament Series out of the way, we decided to try something new. 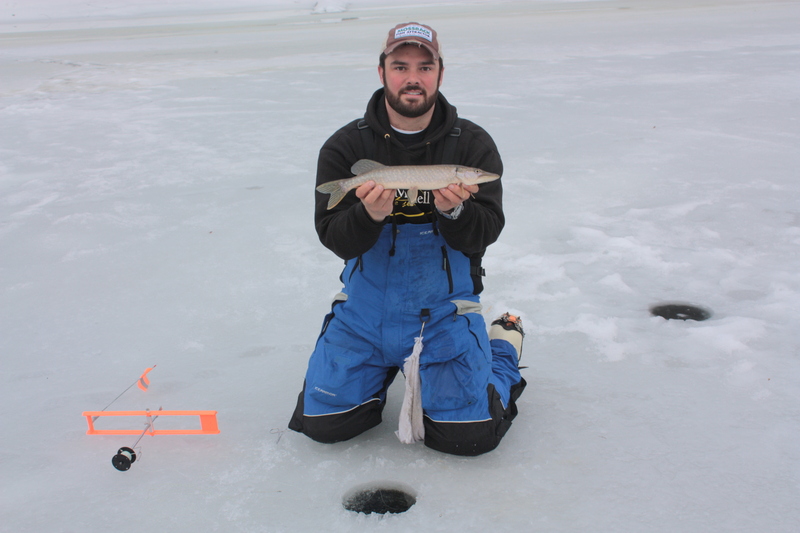 Our main goal was to try to find some walleye using tip ups but mainly to chase flags and kick back a bit. We caught fish but it wasn’t fast and furious with the abundance of fish we knew were present. 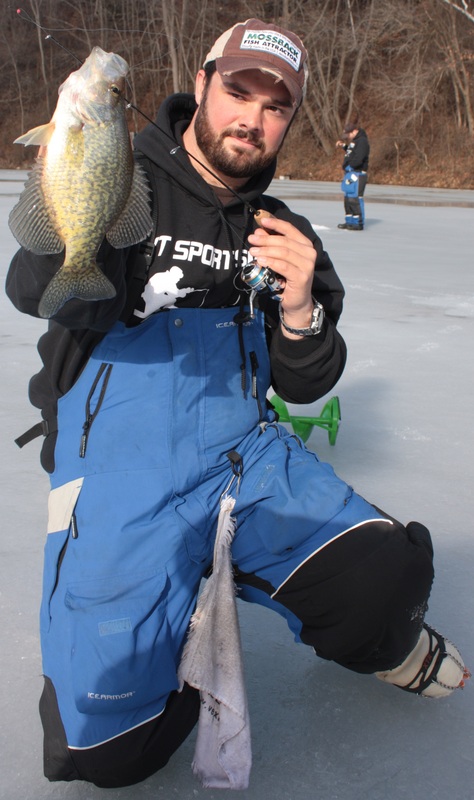 We caught rockbass, northern pike, crappie, and perch. We had ten tip-ups out spread from 15-30 feet. Our bait of choice was medium shiners set just off the bottom. Our first flag popped about the time we got our fifth flag set. After a short run the fish was still on but bit the line as soon as tension was applied; Presumably a northern pike. From there on out, we had regular flags but none of our desired species. 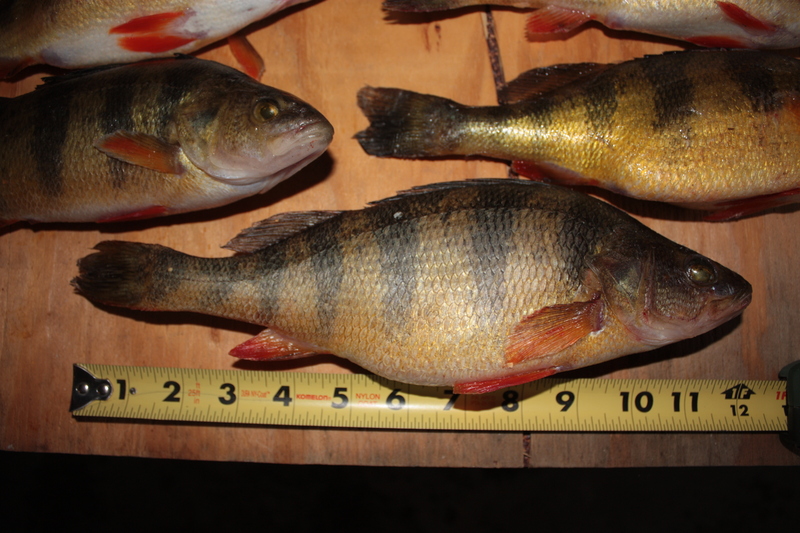 Perch seemed to be the main culprit of dropped and stolen baits as they were the majority of what we were able to jig up and catch on the tip ups. After a few hours of slow fishing we packed up and headed out. Being outside of Vermont, bait laws were not an issue so we checked one more spot before dumping our bait. The second spot was a dud. 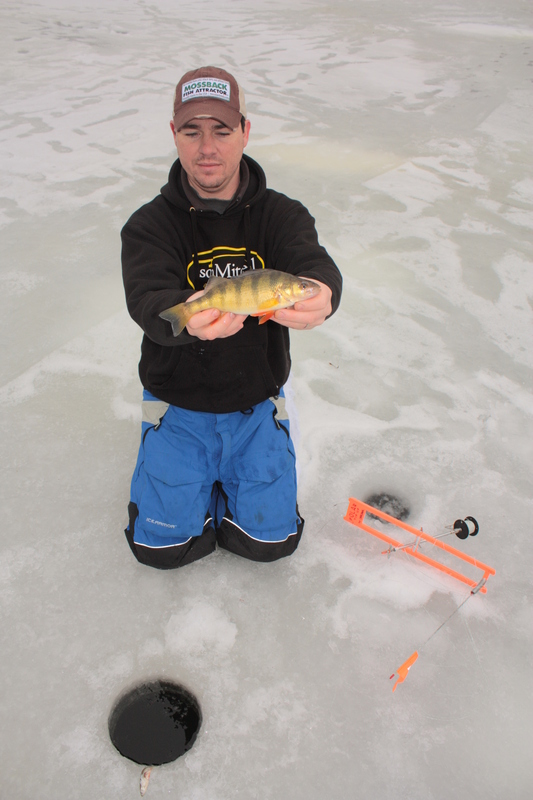 The ice wasn’t great and the amount of fish in the area was nothing to hang around for. One more spot that was on the way home had been in the back of out head for a while now. 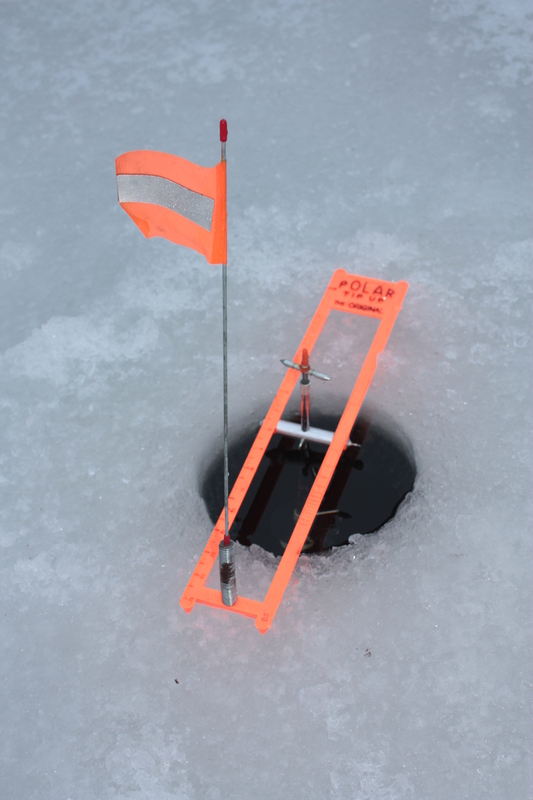 The first hole we punched revealed about 6″ of good hard ice. Hoping that we could fish fish we punched holes over a large area and looked around with an underwater camera. Very few fish were found in the area but once we located a good patch of weeds, we found the fish. Bluegill, pumpkinseed, and largemouth bass were cruising around in decent numbers. After catching a few fish, we called it a day. Long hours on the ice in recent days have tuckered us out. A low key night is just what the doctor called for! With a Vermont Sportsman tournament only a day away, pre-fishing the designated area was the intention but a group of good friends went elsewhere so we went for the comraderey. We arrived to our fishing spot that morning and slide to the area that we knew was holding fish. Fortunately for us we were able to make it there early enough that we could claim our spot. This body of water has seen a major increase in tip up fishermen this year due to the fact that this is one of the few places in the area that has solid ice. Our friends from a far arrived and we visited and set up shop for the morning bite. 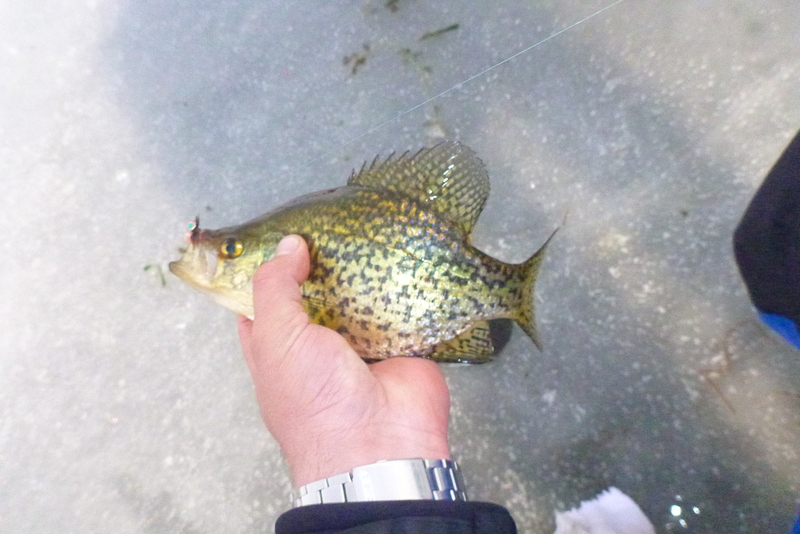 First bite was strong bring in decent numbers of crappie, bluegill and big river perch. The boys from New York are obsessed with big perch so it was a sight to see them pull some nice gold’s out of shallow water. The fish didn’t cooperate for too long. We worked our way along the channel and didn’t see much action so we cut another string of holes closer to the edge where the channel meets the weeds. By this time a number of fellow fishermen have arrived and proceeded to set up their gear for pike. There was a lot of noise and the fish quickly became spooked. This string of holes along the weed edge would soon pay off. With all the pressure developing as the morning went on the fish that wanted to be in the channel feeding slide just out of it and tucked into the weeds along the edge. 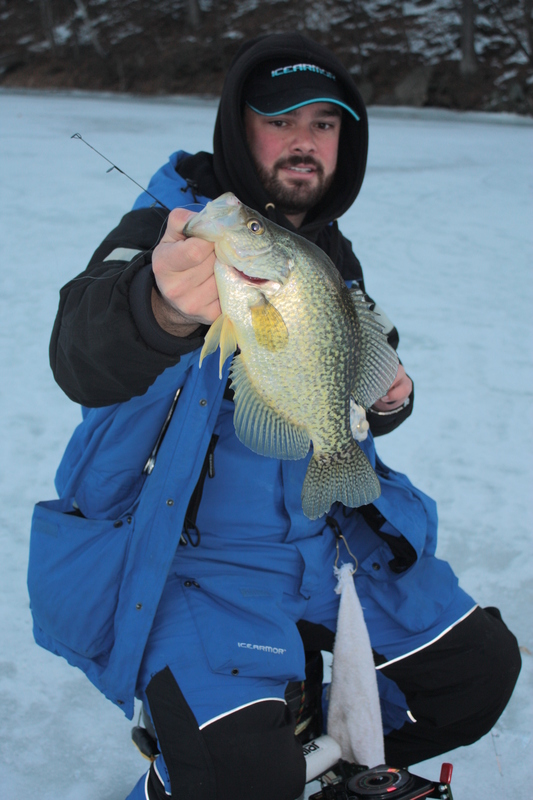 As we worked our way back through we ran into a good sized pod of crappies cruising the weed edge feeding. The fishing was fast but lasted only a short time. We tried to follow the pod as they roamed the channel but they managed to sneak away from us probably doubling back. It was a good day fishing, but more importantly it was a better day spent with good friends enjoying each others company. 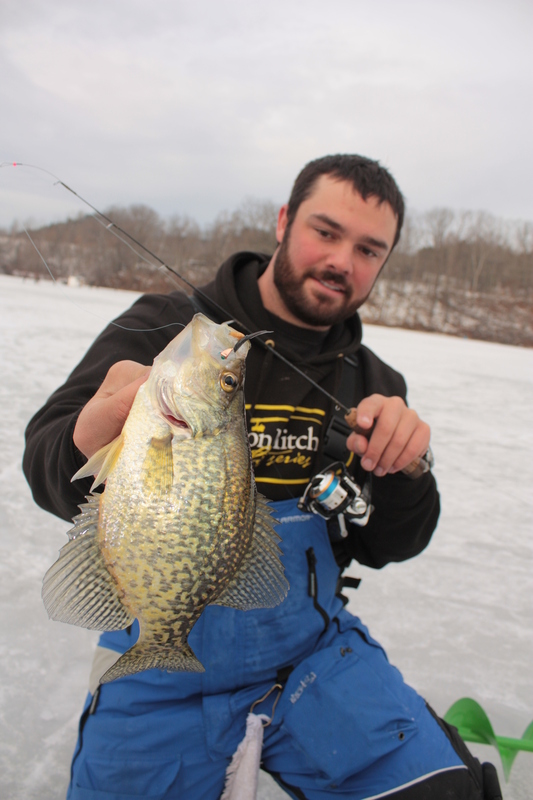 Check out Mixed Bag Of Panfish on our YouTube Channel! 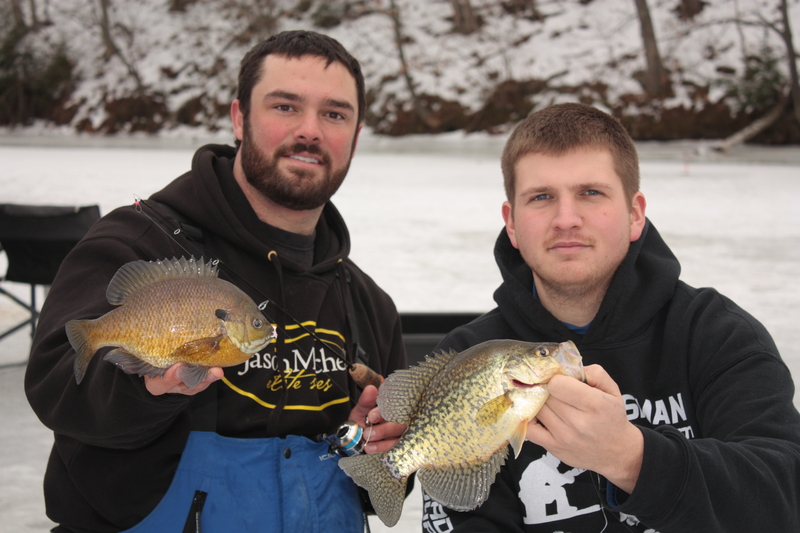 Saturday the 12th of January brought on the first leg of VTSportsman Tournament series. This series has grown over the years and each event gets bigger and better thanks to the great effort put forth by Scott Blair and James Vladyka. The first event was originally scheduled for Dillenbach bay but lack of ice forced the directors to move it to a safer location, Mallets Bay in Colchester Vermont. Along with a location change there was also a slight rule change. 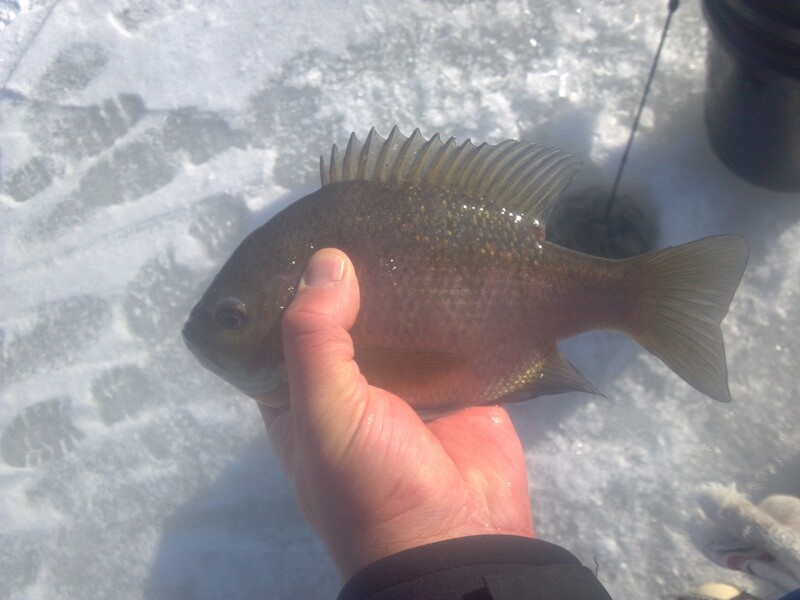 Fishermen were now fishing for 12 fish, only Bluegill and Pumpkinseed as opposed to the normal 6 fish, 3 crappie 3 bluegill/sunfish. Word on the street was that the big seed bite was good early in the week but high fishing pressure caused them to scatter making them very difficult to fish on tournament day. 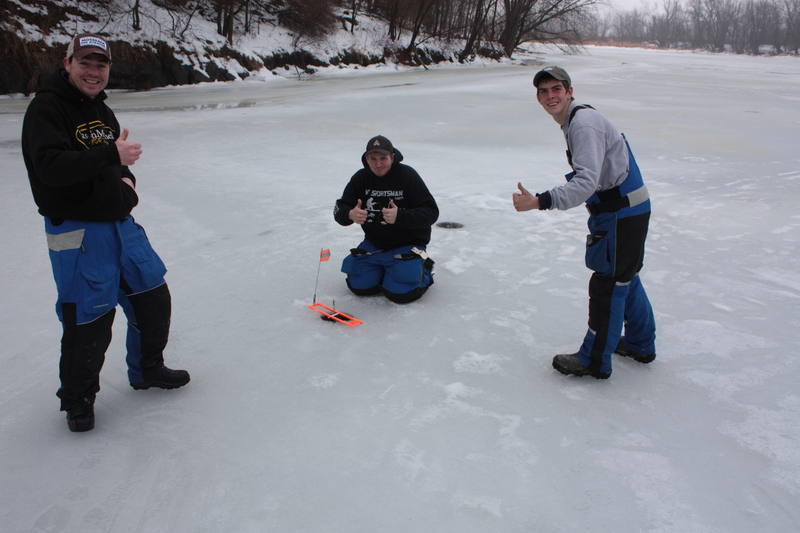 49 Fishermen were greeted by standing water on top of 6-7 inches of ice. Fishing was slow to say the least, that is until you put away your electronics. The weeds were so think in the bay that it was literally impossible to use your electronics in every hole. We fished in about 10 feet of water and 6 feet of that was thick weeds. It didn’t take long for the seasoned fishermen to put away the electronics and just fish. The big fish were also hard to come by. Most anglers found success jigging close to the bottom, but getting to the bottom was tough to do. Heavier Tungsten jigs seemed to allow you to get the jig through the weeds and to the fish. Once you found a hole that produced some fish, no matter what size, it was in your best interest to sit them out. Fish weights varied as anglers had a tough time changing their ways. Here are the results of the top five and big fish. 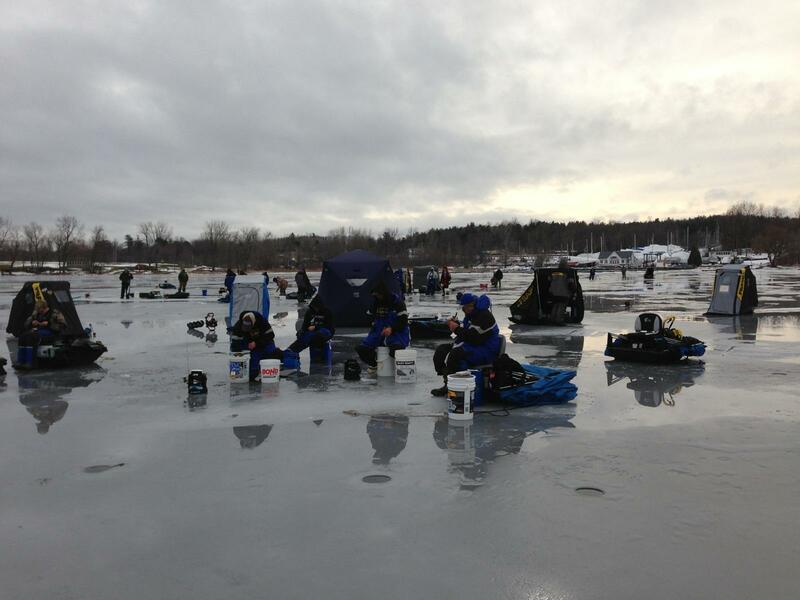 Most people were able to bring their limit to the weigh in, which was Emceed by Mr. Ice fishing Dave Genz. Here are a few statistics from the day; thanks to Andy Silovich for putting these together. This is what a tournament day looks like when cramped on a small fishable area with an even smaller school of fish! This was one of the first times that either of us caught a crappie and it disappointed us. I only had a few hours to get out today but I figured it was worth giving it a shot. It was my first trip to this particular spot and I had high hopes that the ice was decent. The ice ended up being fine in some spots but it took a bit to find a spot to get on that I felt comfortable with being by myself. The shore at the launch was all busted up and I didn’t feel like taking a swim! Once on the ice, I punched some holes and started looking for fish with my underwater camera. 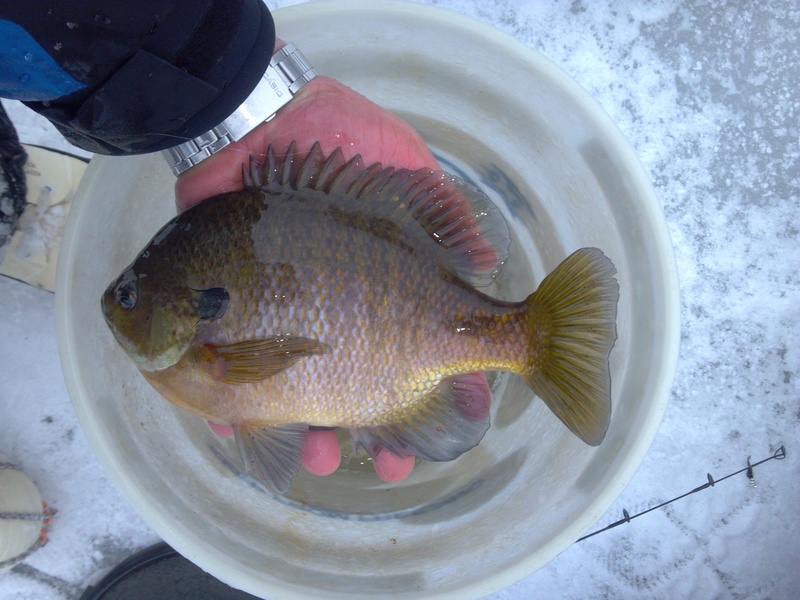 The bluegill were there but not in size or numbers. I caught a few decent sized fish 8-9″ but nothing like I am use to here. It didn’t seem like they cared what colors I used. Just about every fish that I saw bit whatever I put in front of it. It’s funny how some days they are picky and some days anything goes. Too bad I couldn’t have lined up the good bite and big fish day! I punched out a larger area than I had ever had to at this spot. The large weedbed usually holds all the fish needed to get me through a day. They were spread thin and tucked right into the bottom of the thick weeds and on the edge of a mud channel. They weren’t on the move at all and I would guess that it was most likely because of the high sun when I arrived around 9a. After a few hours of slow fishing, the punishment was too much so I decided to head home early for the day and catch up.